A Boutique With An Eclectic Brand, Chic Vibe & Unique Product Mix. The Eclectic Brand, The Chic Vibe & The Unique Products Define This Boutique Experience. Have you ever wondered what is inside the red carriage house, the one with the enchanting garden and working water wheel, that sits set back off Skippack Pike? The sign says Accent On The Rocks which can leave some puzzled, but the flag says OPEN so why don’t you come on in? 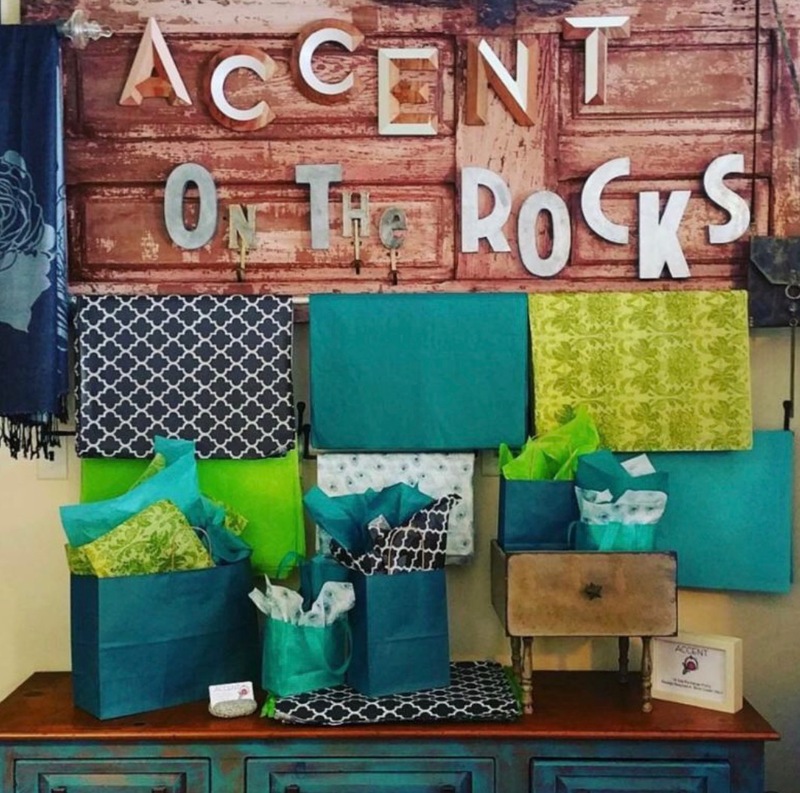 Accent On The Rocks is an extraordinary boutique featuring artisan crafted jewelry, fashion forward clothing and accessories, as well as home accents and giftware, all infused with style and originality. 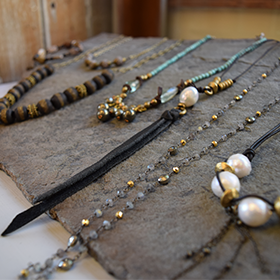 Although the product offerings are now more diverse, the name, Accent On The Rocks, was originally inspired by a love of artisan jewelry and its focal gemstones, or rocks. It was this focus that inspired owner, Mary Lucas Bohidar, to go into business and open her boutique. Mary has a creative background with a Bachelor of Fine Arts in Graphic Design and has worked with various mediums, but her talent shines most when working with ceramics, glass, and jewelry. In the past, Mary sold her own collection of jewelry to galleries as well as directly to customers at juried craft shows. Now she takes pride in selling the work of over 50 artists in her eclectic boutique, Accent On The Rocks. 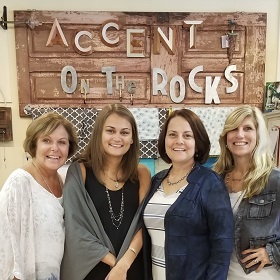 Although Accent On The Rocks is only coming up on its 4-year anniversary this September, Mary’s family has been a part of the Skippack for over 40 years making them the longest active business owners in the village. Her mother ran two businesses – Granny’s Nook and Amelia’s – for 38 years combined until her retirement. The vibe certainly has changed over this span of time but the one thing that remains consistent is the great shopping experience and warm, friendly atmosphere inside this sweet carriage house. This chic boutique carries a diverse offering of high quality, desirable items in an affordable price range. Whether you’re looking for that special gift for a friend, searching for a cute outfit for yourself, or just need some retail therapy, Accent On The Rocks is your go to spot. 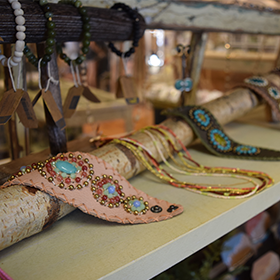 In addition to artisan crafted jewelry, Accent On The Rocks carries several dozen boutique clothing brands and a collection of unique home accents that you won’t find at the mall. Some of the most popular home goods include barware that has an elegant yet earthy feel featuring stone details. At Accent On The Rocks, the brand, the vibe and the product all have its own uniquely consistent feel. The knowledgeable and engaged staff tailors the shopping experience to every customer’s needs and desires. The overall friendly shopping experience, where customers have a one stop shop truly makes this boutique stand out from the crowd. The creativity never stops flowing at Accent On The Rocks. Following the success of the Spring Fashion Show, Accent On The Rocks will preview fall collections in a Fall Fashion this September. The event will be held outside, surrounded by lovely landscaping, and customers will model the new collections. There will be food, drinks, music, fun, and fashion! Like Accent On The Rocks’ Facebook page for updates and keep an eye on the SkippackVillage.com events page for the Accent On The Rocks Fall Fashion Show date announcement!